The block measurements can be found in this post, and the construction methods can be found in this post, (although I pressed the seams open on this one). The fabrics are from various Denyse Schmidt lines, including Hope Valley, Chicopee, Ansonia, Shelburne Falls, Hadley, Florence, and a few prints from her lines at JoAnn's. I haven't said it in awhile, and I can not say it enough. Thank you for stopping by, reading and taking the time to comment on my blog. It means so much! 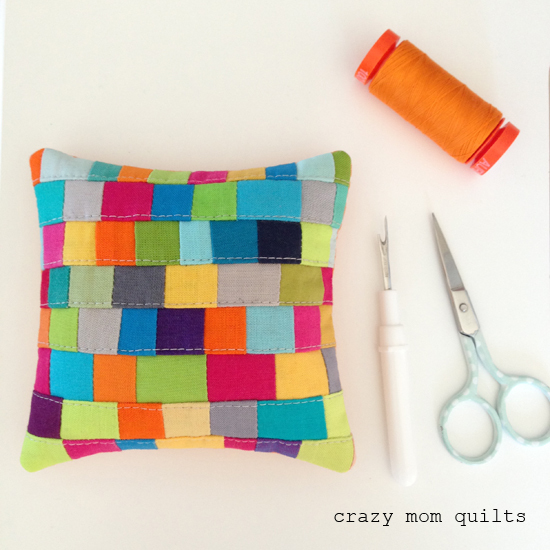 My kids have been home on spring break all week, so sewing time took a back seat....and that's ok! My kids are growing up (so fast!) and I wanted to soak up as much time as I could with them. I'm thankful that it's been a good week. We've had several spring breaks that were a little dicey. Ha! 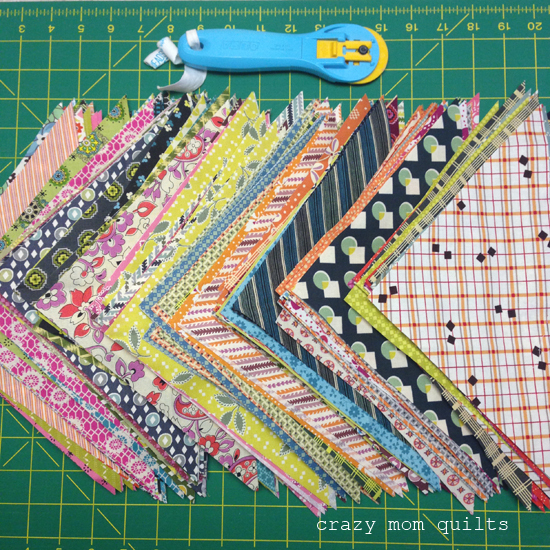 I still needed a finish for today, so I turned these little ticker tape blocks (that have been a WIP for years) into a mini quilt. Each of the tiny scraps are fused to an Essex linen background with Lite Steam a Seam 2. It was not a quick process! I quilted it heavily, to ensure that the pieces would stay put. My daughter picked out the yellow binding. I was kind of on the fence about it, but now that it's finished, I love how it perks up the piece. The mini measures 15 1/2" square and it's scrap project #131. 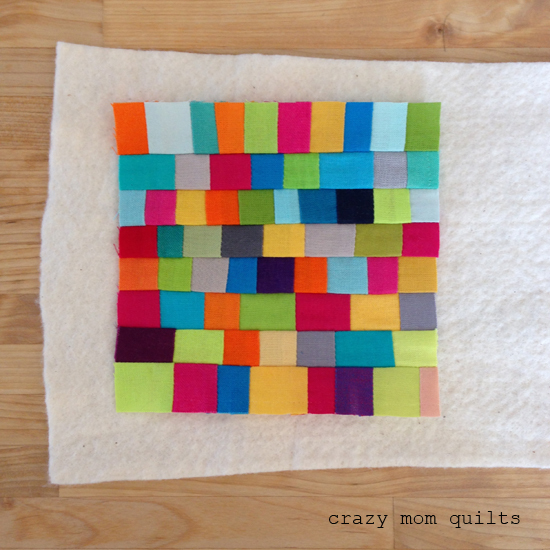 This is the 3rd in my series of Frugal Gal Mini quilts. You can see the first one here and the second one here. 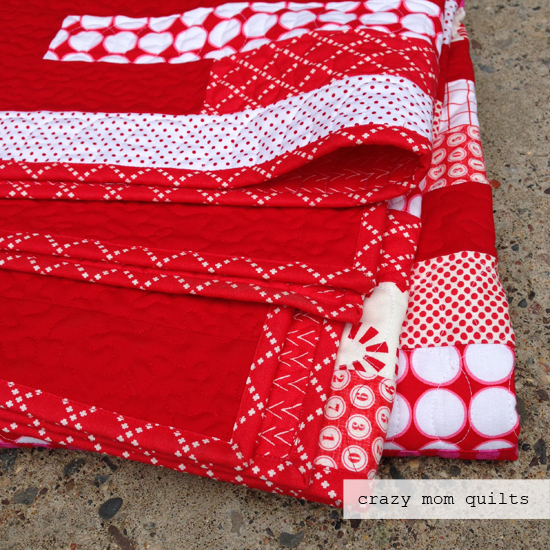 My epic Denyse Schmidt quilt is coming along nicely! I currently have 49/90 blocks made. This fabric is kind of magical. Some of the prints, on their own are kind of ugly (sorry to say it! )....but when you put them all together, something magical happens! It's the craziest thing. Those magentas and citron greens really add a lot of zip to the quilt. The darks do, too. 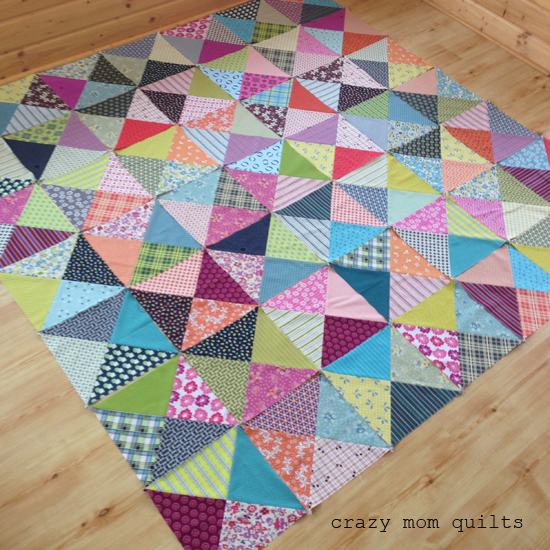 Each of the squares were cut at 12 1/4'', then cut on the diagonal, twice, to make quarter square triangles. 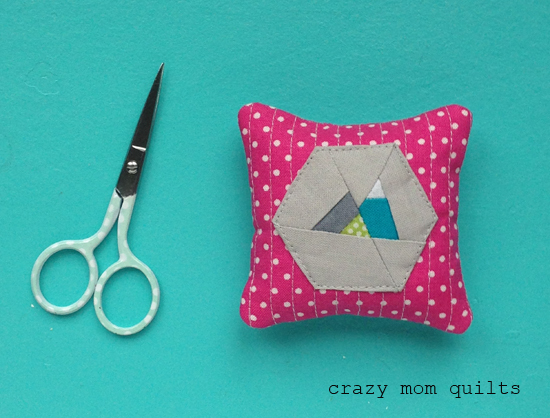 I mixed all of the triangles up and started sewing them back together, randomly. 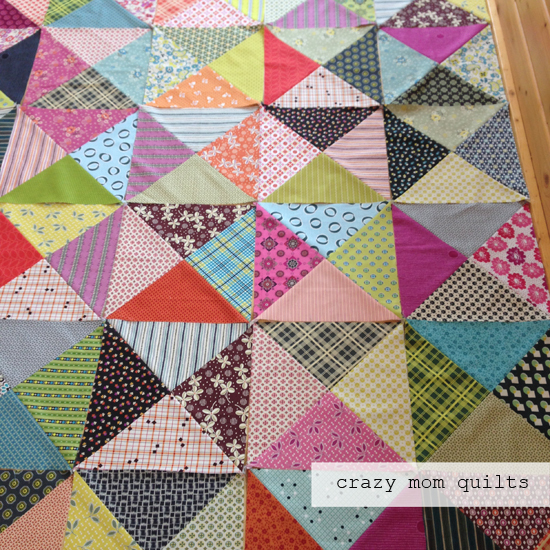 I love how this quilt is shaping up! I can't wait to stipple it! Good morning! Today I'm happy to be a stop on the Tiny Things Blog Hop! 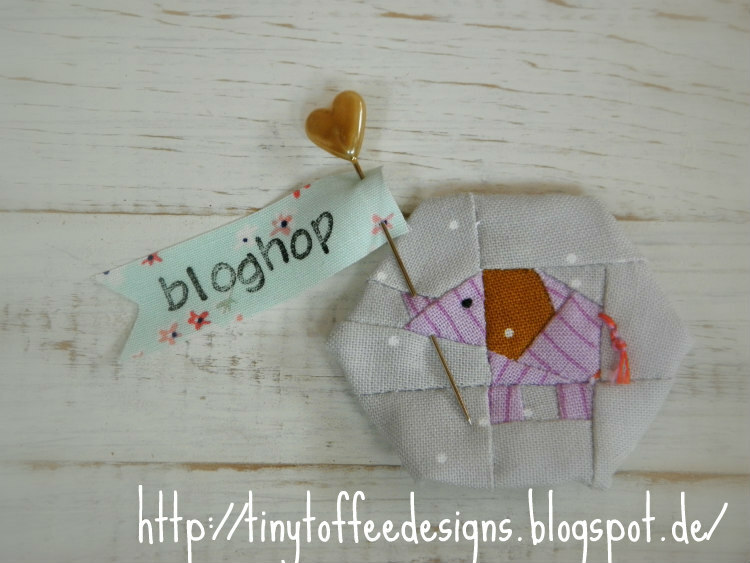 I wasn't familiar with Susi's work (tiny toffee designs) before she contacted me and asked me to be a part of her blog hop, but after one glimpse of her work, I certainly wouldn't say no! Her work is amazing. And tiny. And oh-so-good! I made a version of her mountain pattern. 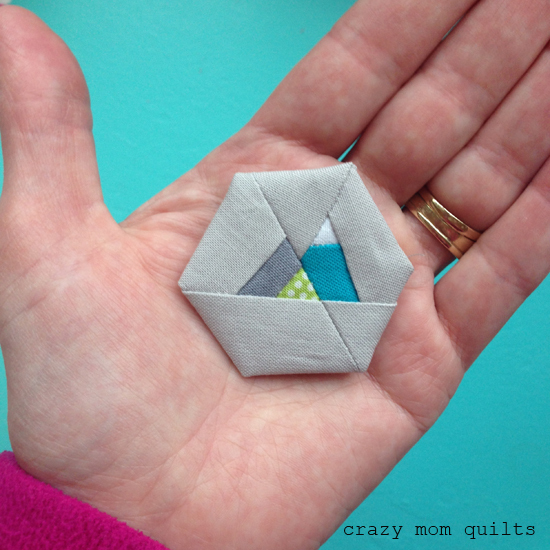 This little paper-pieced mountain range fits on 1'' hexagon! Seriously! I used scraps from my ticker tape scrap drawer (which I shared in my last post) and I even had to trim some of my scraps down. (Ha!) It's good to find a use for those small little pieces! 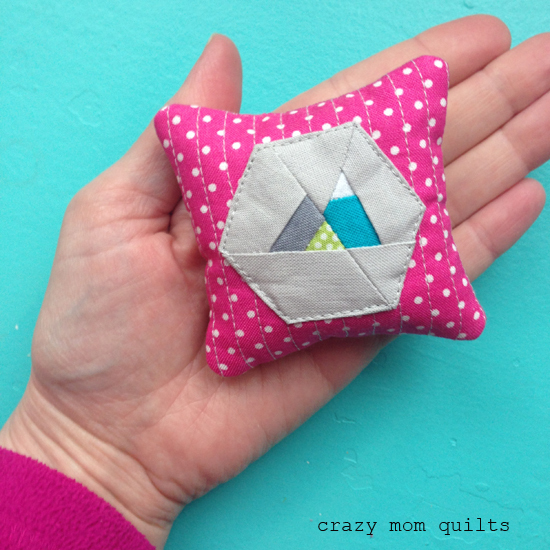 I turned my hexagon it into a pin cushion, of course! There was a fair amount of squealing when I made this. It was so. much. fun! And, while the pieces are tiny, the construction wasn't tricky, really. 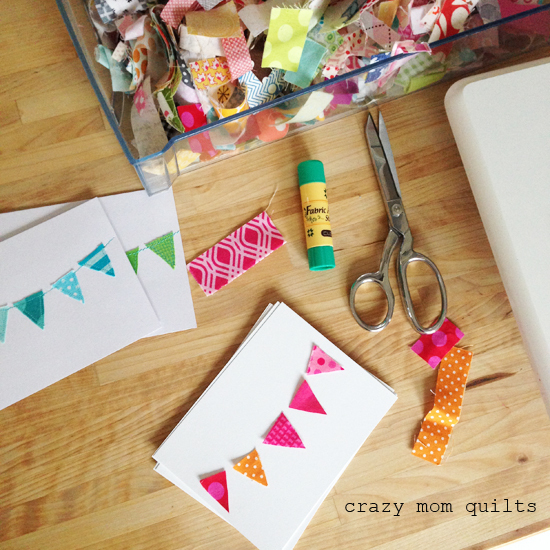 Paper piecing made it very manageable. I definitely plan to make more! 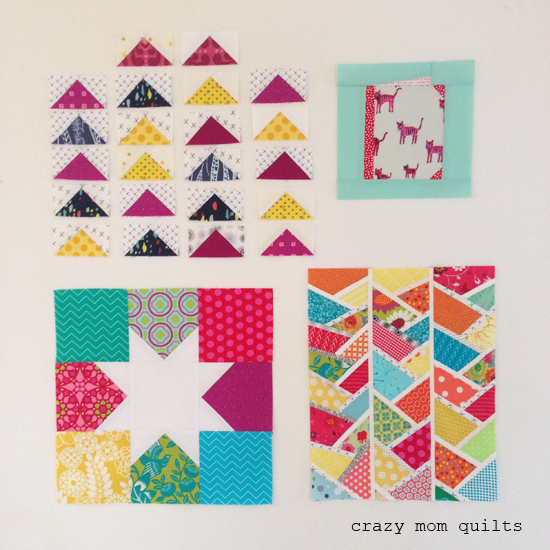 The dream big pattern collection includes 7 different paper pieced designs...each one as darling as the next. So, there you go! Another reason to save ALL of the scraps! Oh, and speaking of that...this is scrap project # 130. It measures just under 3" square!!! 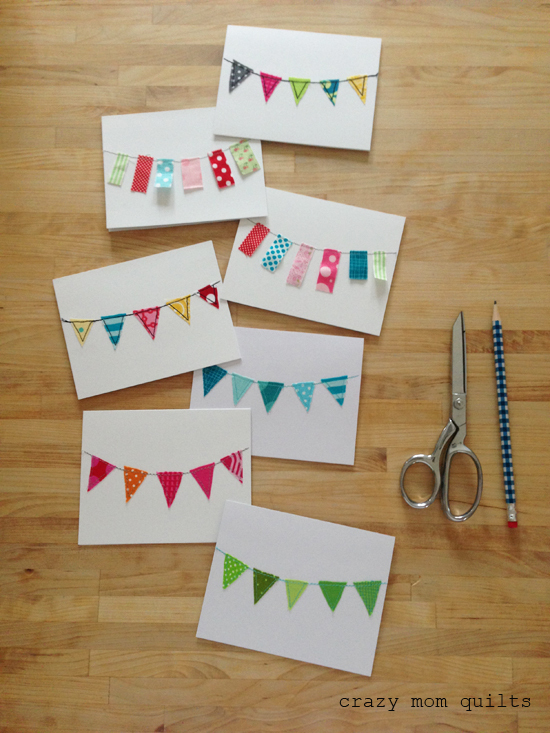 These bunting cards are practical, scrappy, and quick to finish. Three of my favorite characteristics of a project. 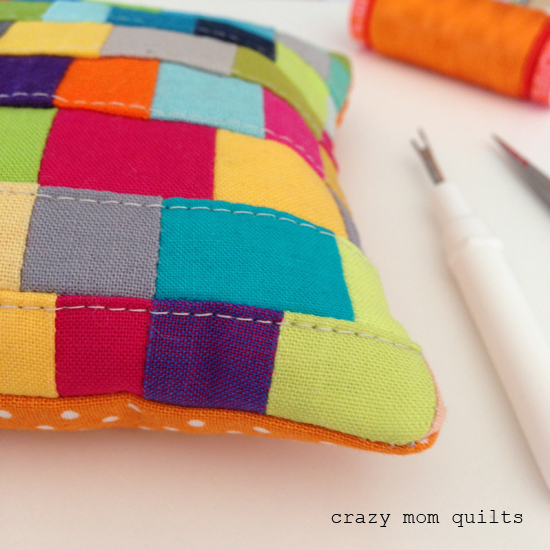 :) I experimented with a few different shapes of scraps and a few different thread colors. It was fun to play! I'm way behind on writing out thank you notes, so this project actually fills a need. I love that! I also love utilizing my drawer of ticker tape scraps. These are a few of my favorites from this round! This is scrap project #129. I need (no, really, I do!) 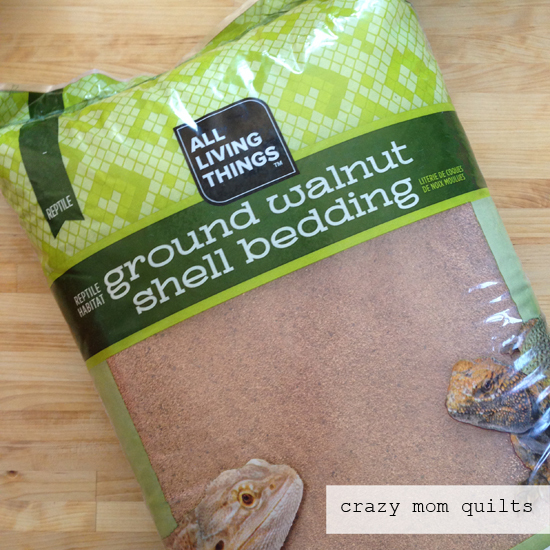 a new quilt for my king size bed. 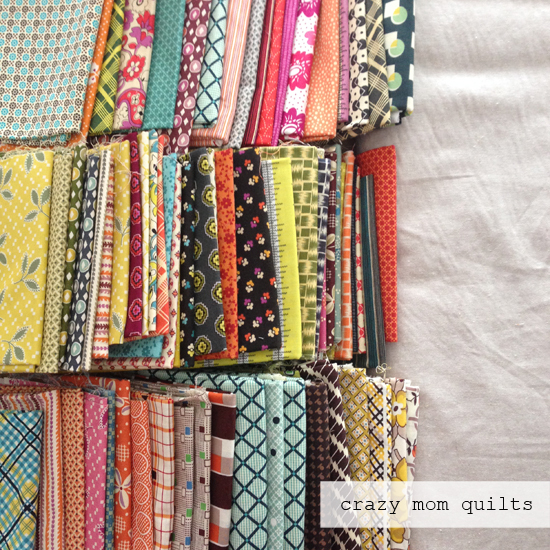 The problem is, I have the hardest time picking out patterns/fabrics for bed quilts. It is quite the commitment! I decided to pull out the good stuff from my stash. 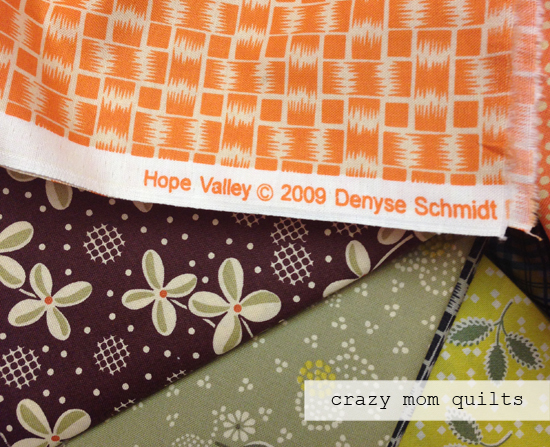 I have quite a nice collection of Denyse Schmidt fabric, so it makes sense to use it. Right? It took me a few weeks to figure out a plan for the fabric, and on Monday, I started cutting. I had to laugh when I saw the year on the selvage. It's only 7 years old. Ha! At least it has aged well! It took me ALL day to cut out the fabric. Thankfully, Mary was here for a sew day, so I had someone to visit with while I cut. I definitely needed the moral support! 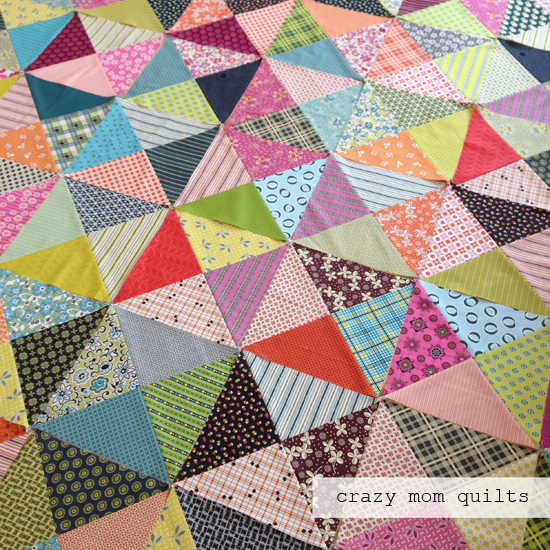 I cut each square at 12 1/4", then cut each square on the diagonal twice to make quarter square triangles. The blocks should finish at 11''. It's going to look soooo good on my bed!!! This photo better conveys the scale. I only need 90 blocks, which means I'm already 10% done piecing the blocks. That's pretty exciting! 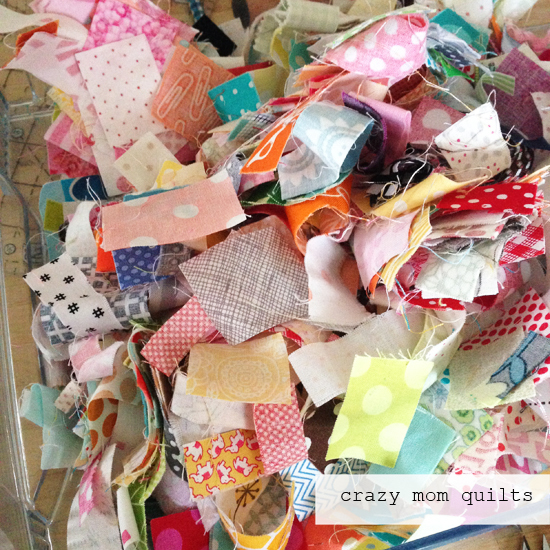 I have another quilt pattern picked out to use up some of the scraps. It's such a fun, vicious cycle! 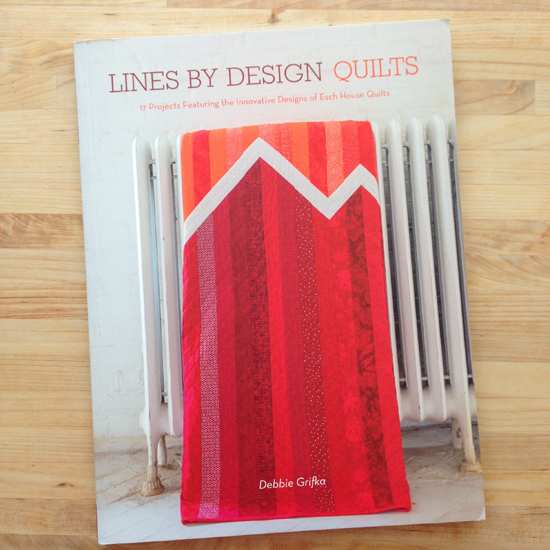 Thanks for all the entries to the Lines By Design Quilts book giveaway! I can't believe how many of you have so much BLUE in your stash. That was far and away the most prominent color stated in the comments. I found that very interesting! The winner of the book is Julierose! Thanks to all of you who entered! Hope you are having a great week! I was in Duluth at Hannah Johnson Fabrics about two years ago. 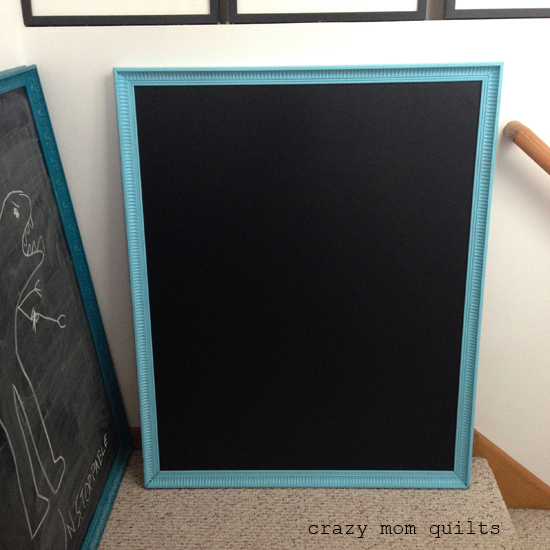 The owner, Janet, sold the chalkboard fabric to me, and she threw in the frames for free. The frames had been sitting, unused, in HER basement for a few years prior to my visit. I think she had intended to use them for something similar to this, but never got around to it. The frames were already painted these lovely colors, which was a bonus! A few weeks ago, I had my husband help me cut down thin backer boards (to stabilize the chalkboard fabric) and last night, my two younger kiddos and I finally assembled them. The kids helped pound in the nails (to secure the backer boards into the frames) and they thought that was the best thing ever. Well, second to actually using the chalkboards. They had such a blast trying it out! I had to chuckle that they immediately started doing math problems....gotta love that! This one will be for the kids, and the other one will be for me. I'm so excited to have this project complete! Each of the frames are about 32" x 41".....nice and large for long to-do lists. Ha! 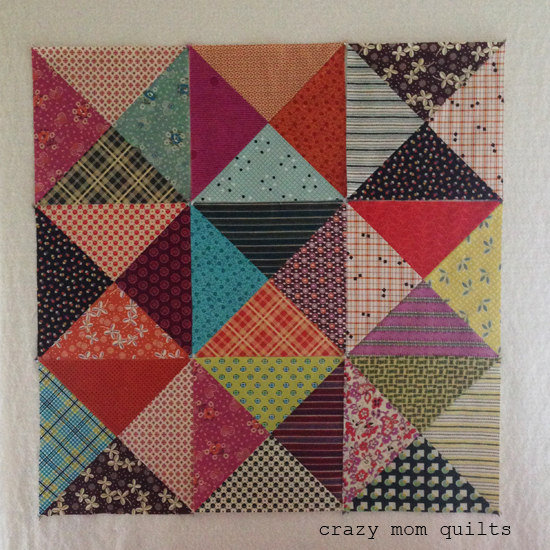 I was playing with scraps this week and got sidetracked from my original project. 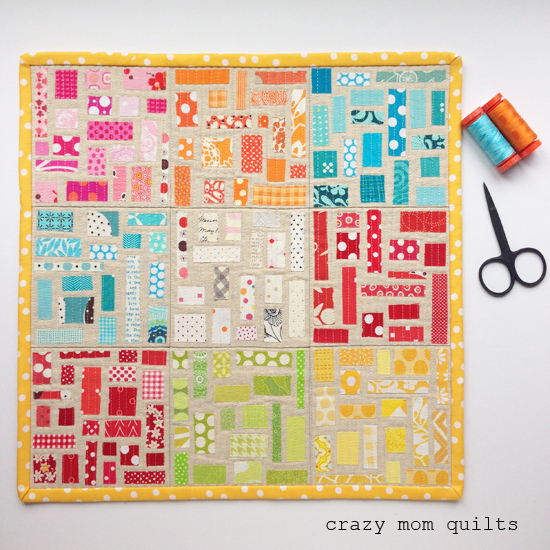 I end up with this tiny block of patchwork, which is about 5'' square! Each of those strips finish at about 1/2''. Teeny, tiny and oh-so-cute! 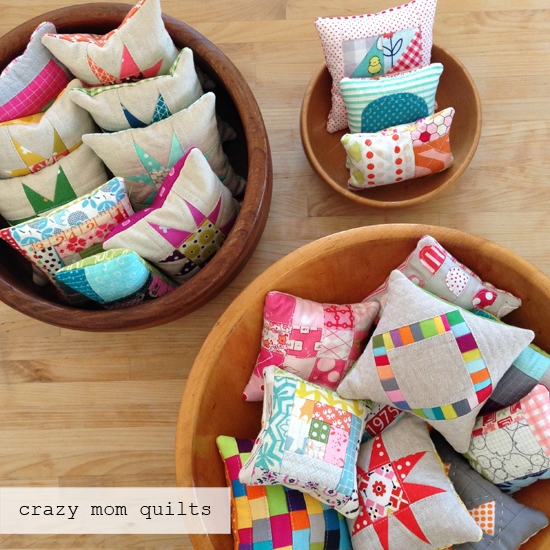 Quilted pincushions are a great way to use up those long skinny strips of leftover batting. It's fabulous! This one might be my new favorite! It reminds me of my kids' tiny Lego pieces. I'm smitten by these seriously tiny (and bright) pieces!!! This is scrap project # 128! 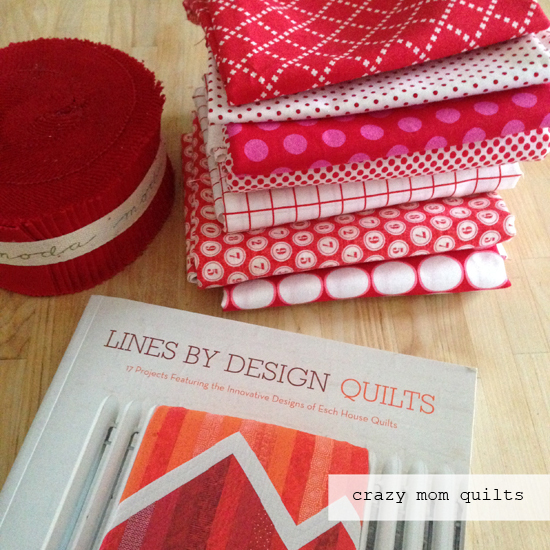 Today I'm happy to be a stop on my friend Debbie's blog tour for her new book, Lines by Design Quilts. This book is so true to Debbie's clean, graphic and straightforward style. 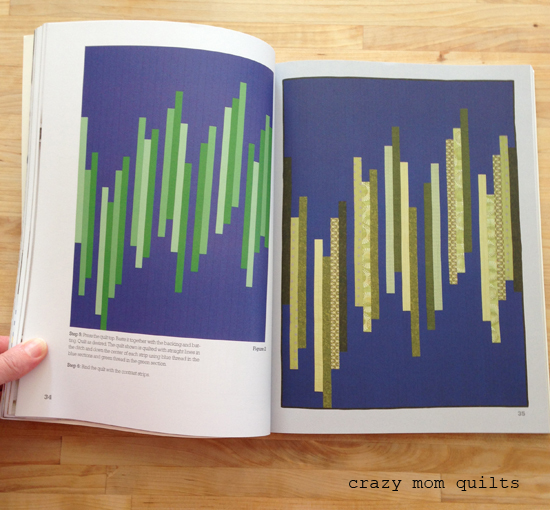 The book contains 17 fun projects--in various sizes--to sew and inspire. It's a beautiful book! 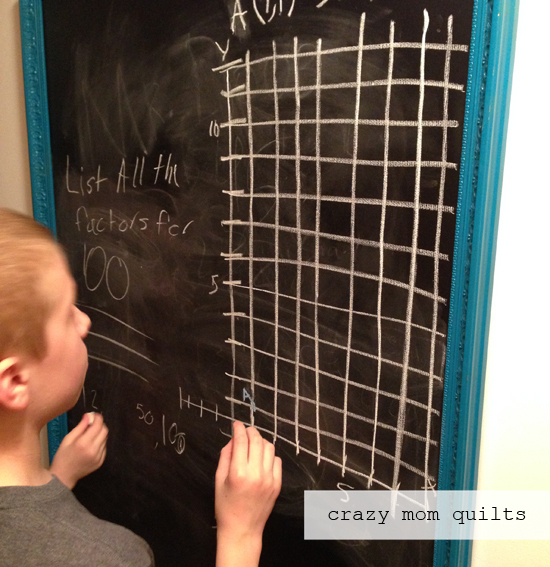 The bar chart quilt caught my eye immediately. I've thought about making something similar to this for a long time, but I never had enough vision to follow through. For that reason, I was more than happy to give this pattern a try. It's much better than I could have done on my own! 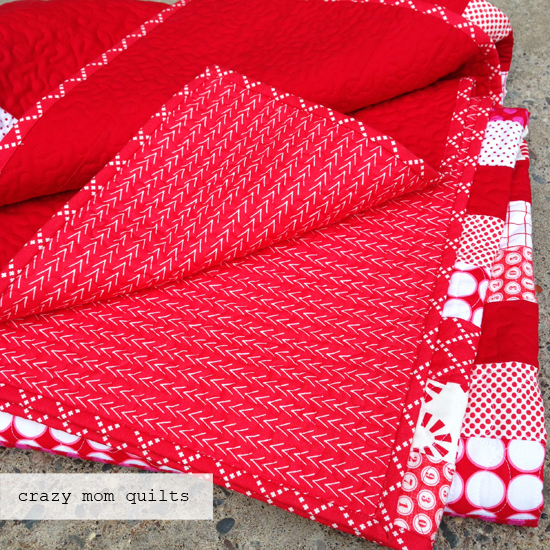 I've had this red jelly roll in my stash for years, so I was thrilled to finally have a reason to sew it up! I pulled various fabrics from my stash to round things out. I am not good at following directions, or counting, apparently, so I had to add an additional fabric to the mix about half way though....but that's pretty typical for me! Ha! Sewing with jelly rolls is messy. Yikes! I bet I will be vacuuming up red fuzz for the rest of the year...but it was totally worth it. 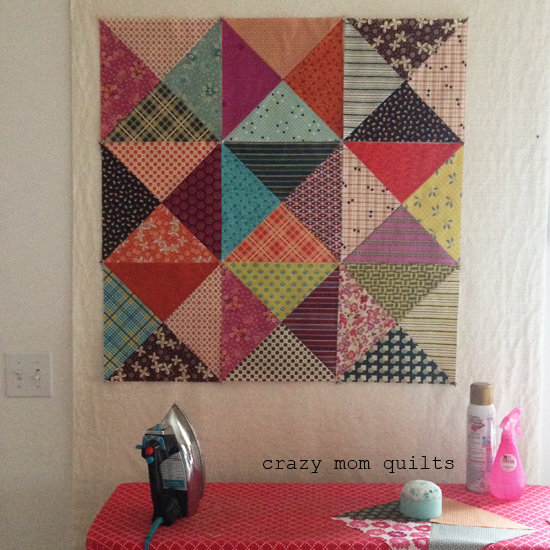 I LOVE how the quilt turned out. LOVE it! When it came time to quilt it, I decided to do a small stipple in the background. 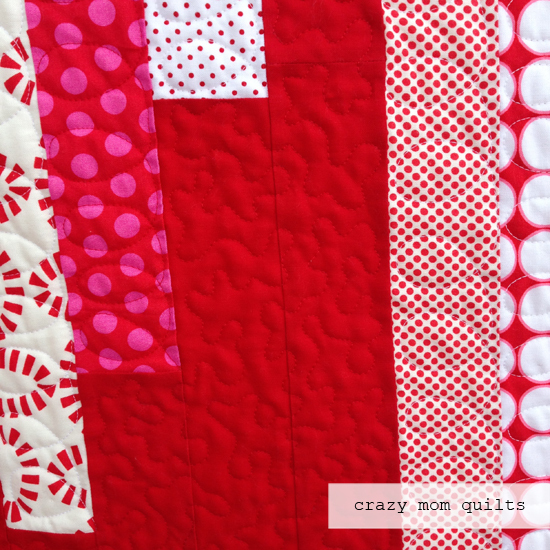 I quilted loopy L's in the printed strips. 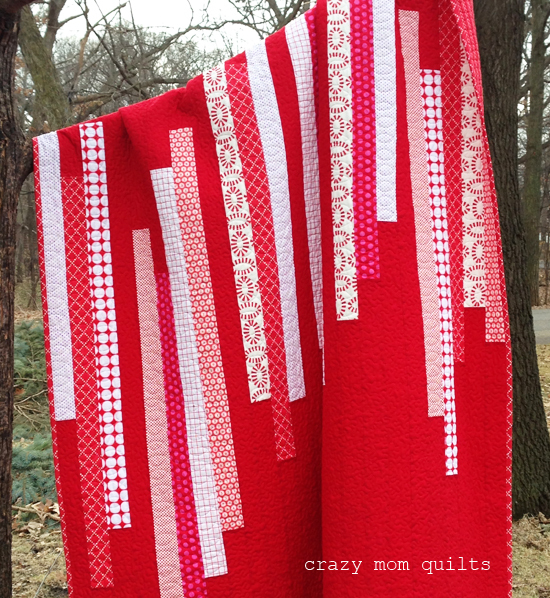 I also changed thread colors for the strips: some were quilted in red thread, some were quilted in white thread. It required me to bury quite a few knots, but it was time well spent. I love how the stippling unifies the background strips. 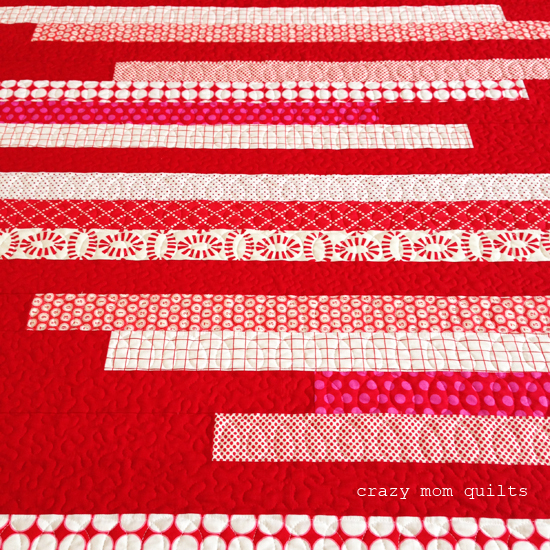 This quilt will be texture-iffic once it is washed! 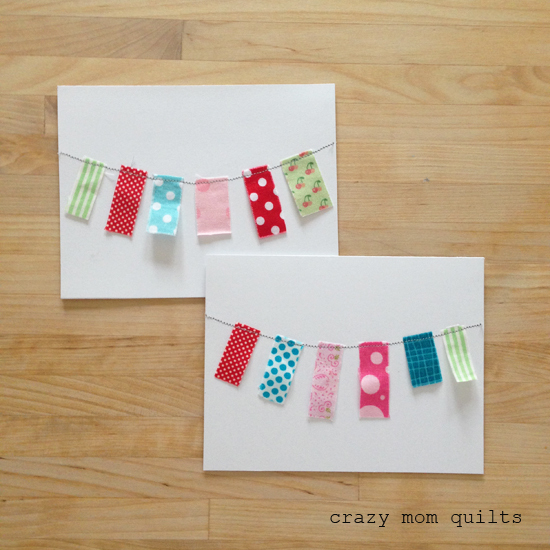 The ovals print (on the left) was the last minute addition to the quilt. I'm glad I had to add one more fabric, because it introduced another scale of print to the quilt. It needed it! 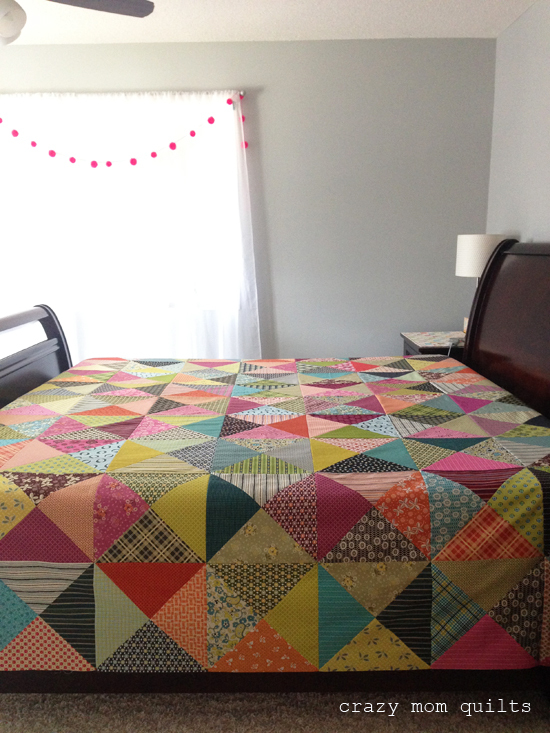 The finished quilt is about 60" x 78" or so. I was tempted to make a few of those strips scrappy, but I resisted. Aren't you surprised? :) Red is a bold choice for the background, but I couldn't love it any more. I need to go bold more often! Since this is a blog hop, Debbie and her publisher are giving away a copy of the book to one of my readers! If you would like to win, please leave me a comment in this post. In your comment, I would love to hear what color of fabric is most prominent in your stash. (Is it because you always use it? Or is it because you never use it?) The contest is open to everyone! A hard copy will be sent to a US resident OR a digital copy will be sent to a resident outside of the US. I will pick a winner in a few days! This week was one for catching my breath and catching up. I was quite behind on my bee blocks, so I spent a few days fixing that. The star block was super fun to make and it's so simple. 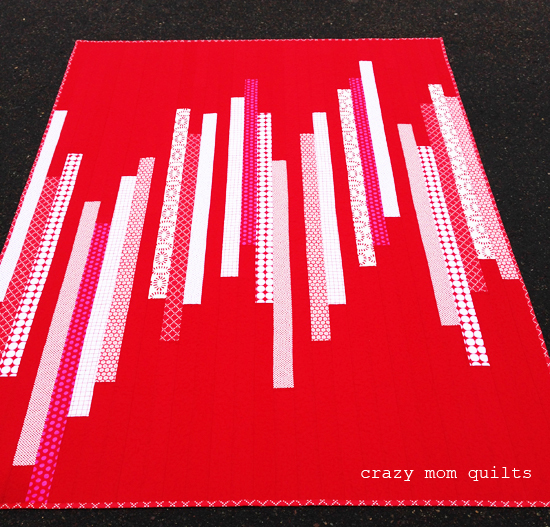 I want to make an entire quilt from that pattern some day. The herringbone block, while cute, was SO time consuming...and it ate a LOT of fabric. Thankfully, there is no shortage of fabric around here. Ha! Phew! It feels good to have those done. Thankfully my friends are patient. :) Now, to get these in the mail...that's always the trick! Did you know that you can link up your finishes from Instagram? See this post for more details. It's your turn! Please link up your finishes for the week. Thanks, as always, for joining me for finish it up Friday!